International tournaments are an important part of soccer showcasing the world's best players in their national team colours, playing for the pride of their country. There are many different tournaments but the ones shown here are either confederation or world championships. Most of these profiles are one page reports on the tournament. However, there are larger sections profiling the 2000 Sydney Olympics and 2002 World Cup. Players cannot be seen as great until they lead their country to glory. If this is not possible, as the player does not play for a top nation, the game of soccer and the individual both miss out. 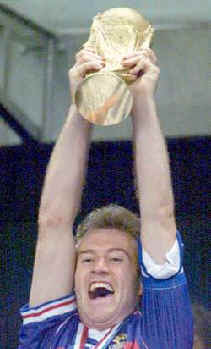 A picture of the World Cup Trophy held up by Didier Deschamps when France won in 1998 is shown below.